More than 700 demonstrators of farmers, consumers, representatives of citizen’s groups, and lawyers came from various parts of Japan to gather around the Diet Building at Nagata-cho, Tokyo on March 30 and held a rally and a demonstration for preventing the ratification of the Trans-Pacific Partnership (TPP) free trade pact, before lawmakers begin extensive deliberations at the Diet on approvals of the TPP accord and related bills. Members of 66 groups including nonprofit organizations, trade unions, farmers, and medical institutions joined the rally. 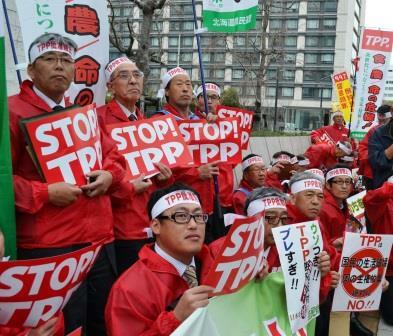 The participants in the rally, flying flags and holding message boards, protested against the TPP and formed a line of more than 100 meters in front of the Diet Building and Diet Members’ Office Buildings in the evening of the day. “The TPP is threating the local economy. The TPP is going against a current trend of local production for local consumption. The TPP ratification does not have any just reason,” Satoshi Daigo, an honorary professor of the University of Tokyo, urged.